(Photo: Ecumenical News / Peter Kenny)Lutheran World Federation President Bishop Munib A. Younan at a Geneva meeting on June 13, 2013. Jordan's King Abdullah II has honored Lutheran World Federation president, Bishop Munib A. Younan, for his efforts towards peace, co-existence and interfaith dialogue between Christians and Muslims in the Middle East. In Amman, the capital of Jordan, Younan, King Abdullah, who is a Muslim, on September 3 awarded Younan, who is bishop of the Evangelical Lutheran Church in Jordan and the Holy Land the Al-Hussein Decoration for Distinguished Service, First Class. The medal recognizes achievement in philanthropy, the arts, science, education, commerce, or public service. 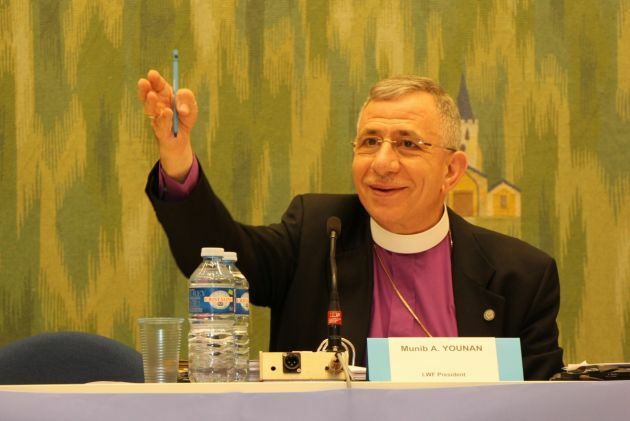 Younan received the medal during a conference hosted by the king entitled, "The Challenges Facing Arab Christians," Lutheran World Information reported. At a time when many Christians worry about the future of fellow believers in the Holy Land, Younan in 2010 became the first Arab elected as president of the Lutheran World Federation. Preaching the day after his election as LWF president in July 2010, the Jerusalem-based bhishop called for prayers "that Palestinian Christians may not lose faith and leave the country." In an interview with ENInews at the time, Younan, who completed his theological studies in Finland, said, "We ask Arab Christians not to emigrate. What is the Holy Land without Christians?" The LWF's highest governing body, its assembly, elected Younan at its July 2010 meeting in Stuttgart, southern Germany. He took office at the end of the assembly. "We as Christians and especially as Lutherans have a role to play in the Middle East in reconciliation and interfaith dialogue," said Younan at the time, who heads the Evangelical Lutheran Church in Jordan and the Holy Land, one of the LWF's smallest churches. "I sometimes ponder the fact that there have been Christians in Palestine since the first Pentecost," he said, recalling that Jesus had walked in the Holy Land. "Now, we Palestinian Christians are less than 1.5 per cent of the population." Younan said then, "According to recent studies by Bethlehem University and the Diyar Consortium, Palestinian Christians are leaving ... for three reasons: the difficulties caused by the political conflict, a lack of jobs, and growing political and religious extremism." "Even so," he noted then, "Palestinian Christianity has survived 2000 years. We have never ruled the country, nor were we ever in the majority. We do not have much property, power, money or influence. Yet, we have survived." The bishop who was 59 when he became LWF president was the only candidate for the post. "In spite of circumstances, we Palestinian Christians try to be brokers of justice, instruments of peace, ministers of reconciliation, defenders of human rights, including women's rights, and apostles of love," Younan said in his sermon. Younan told assembly delegates before they elected him that he was introduced to the LWF as a refugee, when he drank chocolate milk at the Martin Luther School in Jerusalem, and this inspired him to enter the Christian ministry. "My parents were refugees. Our church, the Evangelical Lutheran Church in Jordan and the Holy Land, which grew out of the German mission work in the 19th century, embraced our family and helped us to stand on our own feet," he explained. During the Amman conference earlier this month, Younan noted that Muslims and Christians needed to be working side-by-side to help promote stability and moderation in the region. "This engagement is not just for religious understanding but for shaping our shared political future," he said, while noting that Arab Christians must refuse all types of division in society, whether along sectarian or religious lines. King Abdullah II urged continuing interfaith dialogue. "Arab Christians are the closest to understanding Islam and its true values. We call upon them at this stage to defend Islam, which is subject to a lot of injustice because some are ignorant of this faith, which preaches tolerance and moderation, and rejects extremism and isolationism," the king said.